This book will be made to order for you, please allow 7 working days for me to complete it. Small differences between your book and the one in the photos will exist due to the unique character of handmade objects. This book is made of antiqued brown leather. It was designed to resemble a medieval tome. The metal brads placed in the corners and the lock have a patina to fit the overall antique look of this book. The brads will allow it to lay flat when opened but the surface of the covers will never enter in contact with the table and thus will protect the decoration from scratching. I saw this system used in old books and I just loved it. 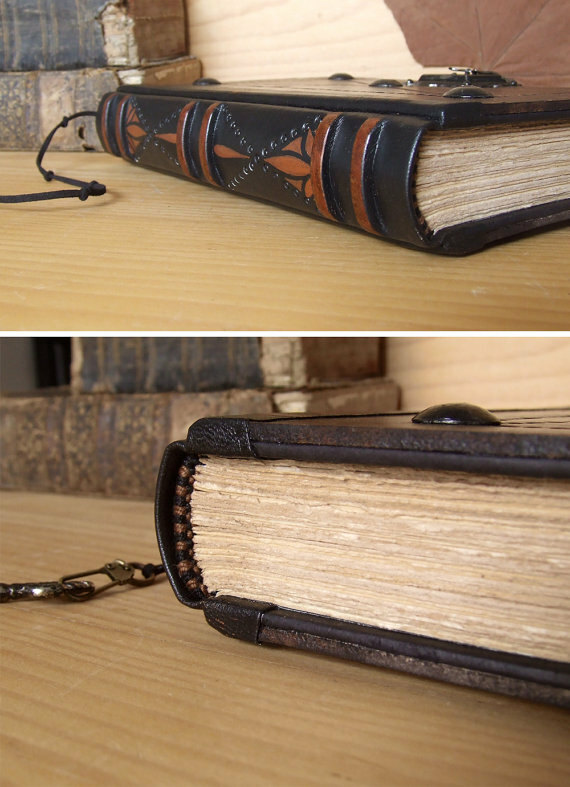 The spine was designed to resemble that of an old book; The raised bands were obtained with strips of leather underneath the one that covers it. It is decorated by tooling and leather paint. The book measures 10.2 x 7.3 inches (26 x 18.5 cm). You can order this book to be filled with artist quality paper OR with writing paper, as you prefer. In both cases the edges will be toned in light brown to make the book block fit better the overall antique look of this book. The end pages are made of brown paper. The headbands are hand sewn by me from brown and black thread.